Charles N. Proctor, the “skimeister” of Yosemite National Park, had a snow sports career that is hard to equal within the world of American skiing. Charles N. Proctor was born in Columbia, Missouri in 1906. He learned to ski in Hanover, New Hampshire after his father, Charles A. Proctor, moved east to teach at Dartmouth College. “Charley” attended Dartmouth and captained the Dartmouth Ski Team in 1927. That same year, he won the Canadian Nordic Combined and the intercollegiate jumping and slalom championships. He topped that season by winning the first Moosilauke Downhill Race. He co-designed a binding for the Dartmouth Outing Club. He had a large following with the Dartmouth Outing Club and was a regular star during his undergraduate days. He was always in top form for the annual winter carnival. Proctor was a member of the 1928 Olympic Ski Team and the second American to ski at the Olympic Games. He placed fourteenth in jumping and twenty-sixth in the combined. It was an excellent result for an under-funded team which did Laps on shipboard to make up for the lack of pre-game training. He also competed in several foreign countries in both nordic and alpine events. With John Carleton, on April 11, 1931, he was first to ski the famous Tuckerman Ravine headwall on New Hampshire’s Mount Washington. His was a brilliant, competitive career. He went on to make outstanding contributions to the development of skiing. He authored a popular book: The Art of Skiing. Proctor was in charge of ski trial design for the United States Forest Service and New Hampshire Forestry Departments. He participated in numerous indoor ski shows and coached the Harvard Ski Team. He moved to California in 1938 where he worked for 20 years as the director of all ski operations at Yosemite National Park. 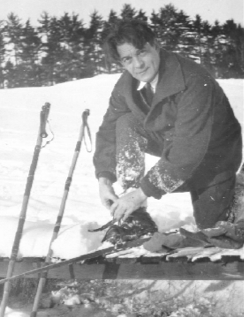 Proctor also served as secretary of the California Ski Association from 1943 to 1946. Following the organization’s change of name to the Far West Ski Association, he served as vice-president from 1957 to 1958, was chairman of the Officials Certification Committee from 1956 to 1958 and held the office of vice-president, competition in 1959. He also served on the Certification Committee and the 1960 Olympic Ski Advisory Committee for the National Ski Association. Proctor was the certified Far West ski official of the Yosemite Winter Club, a life member of the Kandahar Ski Club of Great Britain, a certified of the Far West and Eastern Amateur Ski Instructors associations and a lifetime member of the Swiss Academic Ski Club. He was highly regarded in international ski circles. Charles N. Proctor was an influential person throughout the skiing world and his contributions advanced skiing on a worldwide scale. He helped the early U.S. Ski team when it entered worldwide competition, particularly in Europe, and laid the groundwork for the success of the American teams that followed. Charles N. Proctor was elected to the U.S. National Ski Hall of Fame in 1959. His father, Charles A. Proctor, is also an honored member. If you notice any errors or inconsistencies in Charles N. Proctor's bio, click here to let us know.